Social media at work – embrace it or ban it? Social media is continuously evolving and so is our understanding of the benefits it could bring to your business. We believe there are huge advantages to letting employees engage with social media whilst at work, but on the flipside – what happens if they misuse it? 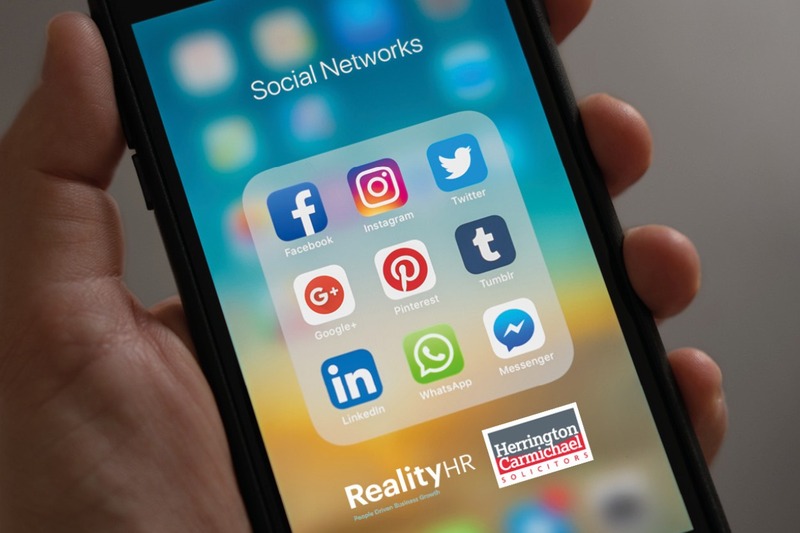 We’ve teamed up with Herrington Carmichael – our trusted solicitors, as they advise on your legal rights as an employer, when social media use goes wrong. 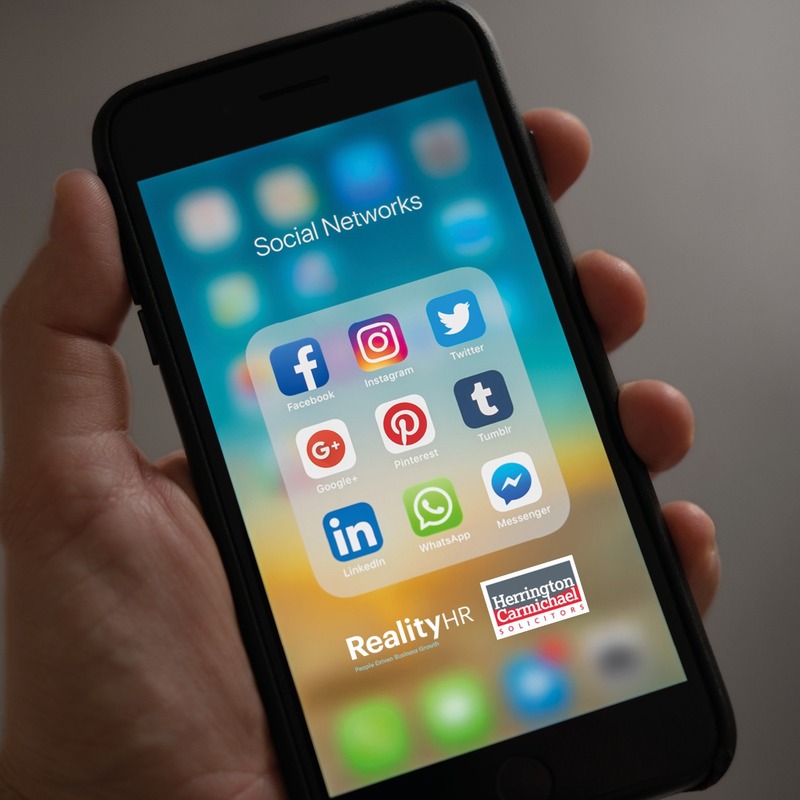 A recent study from the Pew Research Center showed that 77% of workers reported using social media at work – so, even if you did decide to ban it – could you really enforce the ban when most people have access to a smartphone? We’re so well connected nowadays that maybe it’s time to get on board and start reaping the benefits it could bring. Here are our reasons why we think you should embrace social media in the workplace and how we feel it can help your employees and add value to your business. Taking a short mental break from work should be actively encouraged and employees should be allowed to spend that time as they see fit – some will want to spend that time on social media sites, and that’s okay. You’re demonstrating that you trust them to manage their time. Feeling trusted will boost morale and in turn, happiness. This small act of kindness will make your staff feel valued. Allowing short breaks to connect with family and friends will help improve people’s mood and happiness – leading to increased levels of productivity. It’s simple really – a happy employee makes for a more loyal, engaged and productive member of the team. Everyone’s a winner! Social media sites offer your employees a different way to strengthen professional relationships with people outside of the company. Often these relationships can lead to new opportunities, sales leads, interest in employment, business opportunities and new ideas. LinkedIn is specifically geared towards these types of connections and is a fantastic networking tool for businesses. If an employee has an issue that they can’t seem to solve, social media may be the answer. Posing a question on social media is a simple and quick way to get several possible solutions from people you trust. Sometimes an outside perspective is needed, and social media is a resourceful tool to gain multiple new perspectives, quickly, easily, and free of charge. Equally, it can be used as another avenue for workers to find information that is relevant to their job, or discover new information that they can apply to their job. Both avenues will aid an employee’s personal development. Social media is a great tool for building a positive image of your company. Never underestimate the power of the word-of-mouth. Employees engaging online positively are representing your company – they are your brand ambassadors, and it will all help towards creating brand awareness, particularly with recruitment and business opportunities. If you are encouraging day-to-day posts where your workforce are proactively sharing company articles and posts – it’s an organic way of showing how much they enjoy their role and value the company. This all serves to boost employer branding, as it is a natural way of conveying the culture of your organisation. Everyone likes to hear from real people, so whether it’s a new client, an existing client or a potential candidate – positive personal experiences will instil confidence and trust, as they reflect a professional company with an engaging social media presence. Encouraging co-workers to interact with each other on social media can help to build better relationships. A stronger relationship among employees leads to more cohesive and productive work teams. Social media is accessible almost anywhere, therefore your staff are able to interact with one another, even when not at work. The ability to interact outside of work will help boost employee morale and engagement, and hopefully encourage stronger working relationships. Social media is great way of recognising employee accomplishments, both internally and externally. Use social media to give recognition of outstanding performance, work anniversaries, new recruits, etc. This recognition allows team members to interact with each other, which works to build team cohesiveness. Employees can congratulate each other, keep up with the company’s current events, and interact with more of their colleagues. The interaction and ability for recognition that social media provides can improve overall employee morale. Employees who are more engaged with their company and their co-workers are more likely to stay working for that business. So, that all sounds incredibly beneficial, but what happens when it goes wrong? Where do you stand if your staff start misusing social media? Unfortunately, you can be the biggest advocate of social media at work and recognise all of the benefits, but inevitably, there will be a certain amount of time-wasted. Mostly, this time wasting is minimal, but some will take advantage and even worse than that, some may misuse it. Therefore, it’s important for you to know where you stand if you need to take action against time wasting, malicious intent, bullying and harassment. “Balance is key. I agree with Reality HR that social media is an opportunity which should be embraced. However, it is important to be aware of the challenges that social media can bring too. Case law is evolving rapidly across the spectrum of social media use and misuse, and it’s vital for employers to keep up-to-date. We are advising clients on an ever-growing number of matters that have a social media input, including fairly straightforward cases where employees have used social media in contravention of a work social media policy, either excessively or by posting defamatory comments about the employer, the employee’s colleagues or the employer’s clients. These cases can be simply resolved if companies have the requisite policies in place setting out what the rules are, how they will be monitored and the potential outcomes for breaches of rules. There are some more complex cases coming through whereby social media (cyber-bullying) has played a part in ongoing bullying, harassment and discrimination issues, blurring the lines between work and private lives. Employers are asking us whether they can hold employees to account for posts and comments made outside of the workplace, outside of work hours, and our advice is yes – as long as you have a clearly worded social media policy in place that advises employees that you have the ability to do so.